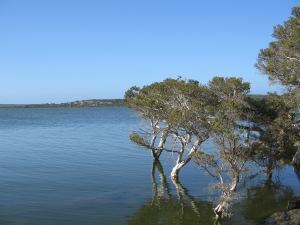 Pannell Discussions » 238 – Ranking environmental projects 4: Environmental condition and values » Ideas in economics, environment, policy and more. Episode 4 in this series on principles to follow when ranking environmental projects. This one discusses how to think about environmental conditions and the resulting environmental values. In the previous post I said that the benefit from an environmental project is the difference between the environmental values with the project and without the project. This time I will break that down a bit. The point of this post is that there are two parts to that change in environmental values: a change in the physical condition of the environment, and a resulting change in the values generated by the environment (in other words, the value of the environmental services). 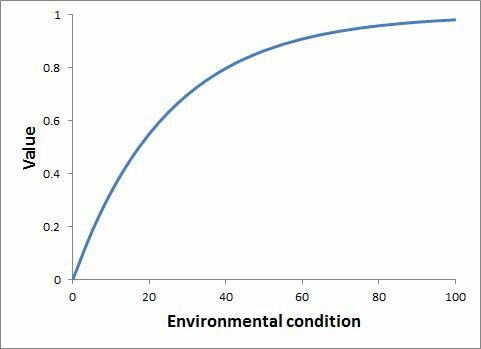 So, to estimate the benefits of an environmental project, you need to (a) predict the physical environmental conditions with and without the project, and (b) translate the difference into a measure of value or importance or significance. The relationship in Figure 4 relates to the values that people in the community put on environmental improvements, but it is also consistent with one aspect of the ways that environmental scientists tend to think about values: if something is rarer, each unit of it is considered more valuable. In theory, if you could quantify environmental conditions and knew the relationship between condition and value, you could read off the change in value from this graph. 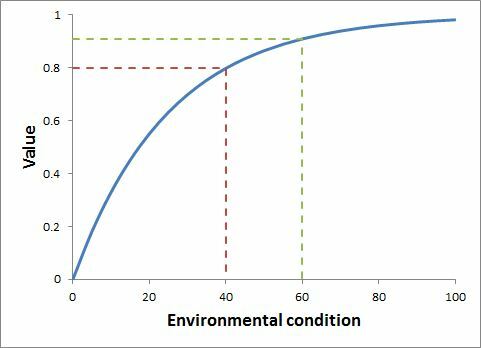 For example, Figure 5 shows that a project that increases the environmental condition score from 40 to 60 results in an increase in value from about 0.8 to 0.9. If we are measuring the value in millions of dollars, the benefit of that project would be $100,000. where V is value, which depends on the physical condition, P1 is physical condition with the project and P0 is physical condition without the project. In practice, we may or may not have a system for quantitatively scoring the type of environmental condition we are interested in in a particular case, but we should at least be able to describe the environmental conditions in words, with and without the project. Then we have to translate those into a measure of value (the topic of the next post). Amongst the systems I’ve seen in use for ranking environmental projects, a surprising number make no attempt to evaluate the difference that the project will make to environmental conditions. Without that, there is no prospect of obtaining a meaningful estimate of the benefits from the project, so decision making (and ultimately the environment) suffers. Posted on 20 May, 2013 by David Pannell. This entry was posted in Economics, Environment, Natural resource management.